AT&T revealed a rather scary report on Tuesday that suggests 43% of teens text while driving. That figure alone is frightening, but the report also says that 97% of teens are aware of the dangers associated with texting and driving and many still do it anyway. In fact, AT&T found that 77% of teens have been warned against texting and driving by adults but still do it "all the time." 75% of teens say it's a common practice among friends, too, and 89% expect a reply to a text or email within 5 minutes. Talk about a lack of patience. 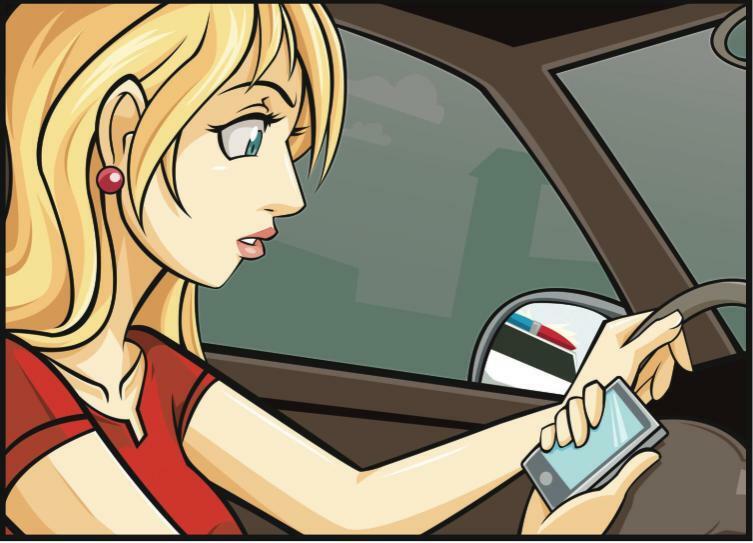 60% of teens text while at a red light and 73% glance at their phones at a red light – that, to us, seems a bit safer than accessing a phone while on the road, but 61% still glance at their phones while driving, too. If you have a teen and want to prevent them from getting into an accident while texting, 62% of teens said that reminders from parents would be effective in getting them to stop the practice. AT&T has addressed the problem with a new DriveMode application that creates a customizable auto-reply message that alerts friends and family they are driving if a text message is received. "Our survey also evaluated teen opinions of drinking and driving compared to texting while driving," said AT&T Director of Consumer Safety & Education, Andrea Brands. "While we're happy to report that 60 percent of them understand texting while driving is as dangerous as drinking and driving, there's still work to be done to make this behavior just as socially unacceptable. The company has also contributed $1 million to educating the public about texting and driving through its "It Can Wait" campaign. Texting while driving is dangerous, but so is texting while walking. A New Jersey town recently started issuing fines to anyone texting while walking after noticing an increase in pedestrians hit by drivers. Pay attention, pull over before you use your phone. With Prom, Graduation, Summer, May Starts '100 Deadliest Days' on the Road for Teen Drivers. AT&T Kicks off Nationwide Car Simulator Tour. A new survey commissioned by AT&T* as part of the "It Can Wait" campaign indicates that while 97 percent of teens know texting while driving is dangerous, 43 percent of them admit to sending a text while driving – and 75 percent say the practice is common among their friends. The survey found that teenagers feel pressure to quickly respond to text messages – and adults are also setting a poor example by texting while driving themselves. Peer Pressure: Almost all teens (89 percent) expect a reply to a text or email within five minutes or less. "Gateway" Dangers: 70 percent of teens believe texting while stopped at a red light is dangerous. Learning by Example: According to 77 percent of teens, adults tell kids not to text while driving – yet adults do it themselves "all the time." What Helps Lessen the Urge: 89 percent of teens said a phone app to prevent texting & driving – like AT&T DriveModeTM – would be an effective way to get them or their friends to stop texting and driving. AT&T DriveModeTM provides a customizable auto-reply message notifying friends that the user is driving and will respond when it is safe. "Our survey also evaluated teen opinions of drinking and driving compared to texting while driving," said AT&T Director of Consumer Safety & Education, Andrea Brands. "While we're happy to report that 60 percent of them understand texting while driving is as dangerous as drinking and driving, there's still work to be done to make this behavior just as socially unacceptable. "These findings help foster even more dialogue on the issue with teens and parents – and we hope the tools we offer like our mobile application, documentary and educational toolkit help in driving home the message that absolutely no text is worth risking a life," Brands said. To help address the issue and show first-hand the risks of texting while driving, AT&T is launching a 30-market U.S. tour of a texting-while-driving simulator, offered by The Peers Foundation. The simulator is a computerized car that lets users virtually text and drive – providing a realistic but safe experience for teens to understand the dangers of texting behind the wheel. "As we head into Global Youth Traffic Safety Month this May, we're proud to join forces with AT&T," said Sandra Spavone, executive director, National Organizations for Youth Safety. "Our combined efforts provide an opportunity to educate young drivers across the nation on the dangers of texting while driving and pave the way for a happy, safe summer on the road." The tour is traveling to local high schools nationwide May 8-June 1. The simulator will tour the West in Seattle and Spokane, Wash; Eugene and Portland, Ore.; Bakersfield, Fresno, Los Angeles, Sacramento, San Diego, and San Francisco, Calif. It will also tour through Dallas, Houston, and San Antonio, Texas; Little Rock, Ark. ; St. Louis and Kansas City, Mo. ; and Omaha, Neb. Other cities include Denver, Las Vegas, Oklahoma City, Phoenix, and Salt Lake City. In Florida, the simulator will travel to Jacksonville, Orlando, Miami, Tampa and Wellington. It will also be in Brentwood and Knoxville, Tenn., and Louisville, Ky.
Last week, AT&T received National Organizations for Youth Safety's 2012 Youth Choice Award for ongoing efforts and working with teens to address the issue of texting while driving. AT&T launched its "It Can Wait" campaign in March 2010. To date, more than 110,000 people have taken a pledge not to text and drive on AT&T's Facebook, Friends & Family and employee pages. Nearly 3 million people have watched AT&T's powerful 10-minute documentary, "The Last Text," which features real stories of individual lives that have been drastically altered – or even ended – because of texting while driving. In 2011, AT&T committed a four-year series of contributions totaling $1 million to help educate the public and spread the word about the campaign. This builds on 2010 contributions of $250,000 to nonprofit youth safety organizations to support the cause. AT&T has also created and maintained anonline resource center that offers downloadable educational resources, such as pledges, posters and PSAs.